Starring Mario Casas, Ana Wagener, Jose Coronado, Barbara Lennie, Francesc Orella, Paco Tous, David Selvas, Iñigo Gastesi, San Yélamos, Manel Dueso, Blanca Martínez, Pere Brasó, Jordi Brunet, Robert González, Martina Hurtado and Ruth Llopis. Distributed by Think Studio. 106 minutes. Not Rated. Screened at the 2017 Philadelphia Film Festival. Time is of the essence to find the truth in The Invisible Guest, the 2016 Spanish crime thriller directed by Oriol Paulo. It is a 105-minute rollercoaster, filled with mystery and intrigue, an accidental death handled with the very worst judgment, and a family trying to get to the bottom of their son’s mysterious disappearance. The Invisible Guest sets its tone of urgency right from the opening credits, marked by sweeping, mysterious music ending in a doorbell. This is the home of Adrian Dora (played by Mario Casas), a young, successful businessman and family man with everything to lose. The doorbell marks the entry of Virginia Goodman (played by Ana Wagener), the no-nonsense witness preparation expert who is trying to fill the holes in Adrian’s testimony, where he is being tried for the murder of Laura Vidal (played by Barbara Lennie). Virginia discloses that there is a new witness that has been brought in by opposing side. She has not been told who it is, but she feels the witness will be damaging to the case. They have three hours to come up with a plan. It starts with her getting the full truth so she can figure out how to work the jury. The facts are these: Adrian was found with the deceased Laura, in the hotel room of an isolated ski lodge. The chain was locked from the inside. All of the windows are locked and window cranks have been removed per the hotel’s winter protocol. His prints are on the murder weapon. Adrian’s story is that he and Laura were blackmailed into going to this room, where the murderer was hidden in the closet and knocked him unconscious from behind. When he came to, Laura was dead on the bathroom floor, covered in the blackmail money. But then how did the murderer/blackmailer leave? Virginia advises that she has two types of clients: 1. the type who accepts the gravity of the situation and cooperates with the truth and 2. The type that thinks they are smarter than her. She believes he is the second type and accuses him of lying. Adrian acquiesces and takes the story back three months earlier. He tells the story of his affair with Laura, an accident that leads to the death of an unknown young man, their poor judgment trying to cover it up instead of calling the police due to fear of their affair coming into the public eye. He paints the story of two people who were having an affair solely for the experience, who had decided to end it and this was an unfortunate mishap that occurred just as they had agreed to get their lives back on track. As they are figuring out their plan, another car drives down the otherwise empty road and stops to see if they are okay. They cover up the situation assuring the driver that no one was injured and they are calling for roadside assistance. The driver goes on his way, but Adrian and Laura worry that the driver may have noticed the blood dripping from the car. They tell themselves not to worry and start on their clean-up plan. Their poor judgment leads to Adrian disposing of the young man’s car and body in one of the region’s many lakes one hour away from the accident scene while Laura calls for roadside assistance to get Adrian’s car started. The film follows Adrian as he handles his part of the plan and the reconnects with Laura after dark, where she describes the horror of how her afternoon passed. I can’t tell you anymore. I just can’t. The back and forth with which the tale is woven is masterful. The story beautifully transitions between perspectives as the story progresses, returning to Adrian’s home with Virginia in the real-time 180-minute situation, and then back to the story between Adrian and Laura. The Spanish dialogue is so quick, lending itself beautifully to the movie’s sense of urgency and in the end, I was grateful for the subtitles. I couldn’t take my eyes off this movie and have been recommending it to friends and family since. Best note of all, it’s on Netflix RIGHT NOW. Copyright ©2017 PopEntertainment.com. All rights reserved. Posted: October 28, 2017. 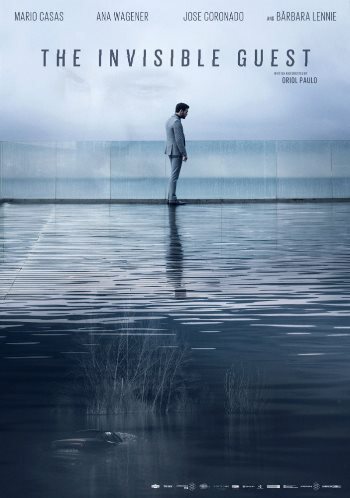 Tags: Ana Wagener, Barbara Lennie, Blanca Martínez, Bonnie Paul, Contratiempo, David Selvas, Francesc Orella, Iñigo Gastesi, Jordi Brunet, Jose Coronado, Manel Dueso, Mario Casas, Martina Hurtado, movie review, Netflix, Oriol Paulo, Paco Tous, Pere Brasó, PFF26, philadelphia film festival, PopEntertainment.com, Robert González, Ruth Llopis, San Yélamos, The Invisible Guest. Bookmark the permalink.